Avi was diagnosed with osteosarcoma, bone cancer, in the thigh bone of his left leg in April 2005, when he was 2 ½ years old. Luckily, the cancer was confined to the leg and had not spread elsewhere. Avi is the younger of two children – his sister Ellie is three years older. At two years old, Avi loved Elmo, Playdoh, music, and playing with electronic toys. It was a typical Saturday morning in April. Avi woke up early, and his dad took him downstairs to play to give mom some extra time to sleep. Avi got tired of the games and went upstairs to find Mom. He fell on the stairs and let out a blood-curdling scream. Mom and Dad ran to him. It took a long time for him to stop crying after the fall, and he did not want to walk on the leg. His parents took him to the emergency room at Suburban Hospital. An x-ray revealed that he had broken his leg, but there was also a suspicious mass on the bone where it was broken. The pediatric attending physician at Suburban was concerned and called the Georgetown University Pediatric Oncology department. They said they should bring Avi to Georgetown right away. The family went straight from Suburban to Georgetown, and Avi was seen by Dr. Aziza Shad, Chief of Pediatric Oncology. She came in on a Saturday to see Avi. The family stayed at the hospital for three days while the doctors did scans, blood work, and other tests. A few days later, it was confirmed that Avi had osteosarcoma, and they met with the doctors to map out a treatment plan. Avi’s treatment took about 8 months. He had 6 weeks of chemotherapy treatments, three different drugs, then surgery to remove the tumor, and then another 4 months of chemo treatments. Because of Avi’s age and the location of the tumor, the best option to prevent recurrence and avoid continuing surgeries was an amputation. Avi had part of his left leg amputated, through a procedure called rotationplasty, in July 2005. He had a month to recuperate and then had to continue chemotherapy for another 4 months. Each time Avi got chemo, he had to stay in the hospital for 2-4 days. He had 20 separate hospital admissions, ranging from 2 days to 7, over the course of his treatment. It was hard on the family to have him at the hospital so much, but the art therapists, doctors, and child life specialists helped make the stays manageable. Also, friends and family helped out with Ellie. Avi completed his treatment the day before Thanksgiving in November 2005 and was pronounced cancer free! In December 2015, Avi and his family celebrated 11 years cancer free. 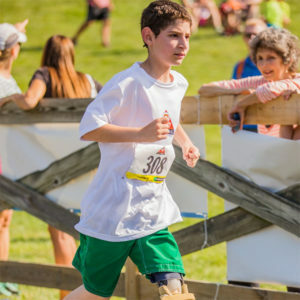 Avi has grown up with a prosthetic leg, but he has not let this get in the way of him having a completely normal childhood. He played on a baseball team, practiced tae kwon do, and currently competes on a swim team. Avi has raced in the JUST TRYAN IT triathlon 5 times and has been a top fundraiser. Giving back to Georgetown is a big priority for the family. In addition to helping with JUST TRYAN IT, they have cooked meals for families staying in the hospital and organized a toy drive. Avi is now serving on the Student Advisory Board for JUST TRYAN IT. Watch Avi’s video to learn more about his story and his experiences with JUST TRYAN IT.